HP Umpire Jerry Layne ejected Athletics P Scott Kazmir for arguing a ball four call in the bottom of the 2nd inning of the A's-Indians game. With one out and one on, Indians batter Jesus Aguilar took a 3-2 fastball from Kazmir for a called fourth ball. Replays indicate the pitch was located over the heart of home plate and knee-high (px .039, pz 1.761 / sz_bot 1.620), the call was incorrect. At the time of the ejection, the Indians were leading, 1-0. Instant Replay Review upheld 3B Umpire Mike Estabrook's live ball (no HR) call in the top of the 7th inning. With two out and two on, A's batter Josh Donaldson hit a 0-0 slider from Indians pitcher Bryan Shaw on a fly ball to deep right-center field, ruled in play for a triple. Upon Replay Review as the result of a request by A's Manager Bob Melvin and initiation by Crew Chief Layne, Estabrook's ruling was affirmed, the call was correct. At the time of the review, the A's were leading, 5-2. The A's ultimately won the contest, 6-2. This is Jerry Layne's second ejection of the 2014 season. This is Mike Estabrook's fourth Replay review of 2014. Jerry Layne now has -4 points in the UEFL Standings (-2 Previous + 2 MLB + -4 Incorrect Call = -4). Crew Chief Jerry Layne now has 4 points in the UEFL's Crew Division (4 Previous + 0 N = 4). This is Crew Chief Jerry Layne's 15th Replay Review of 2014. This is the 50th ejection of the 2014 MLB Regular Season. This is the 19th player ejection of 2014. Prior to his ejection, Kazmir's line was 1.1 IP, ER, 3 BB. 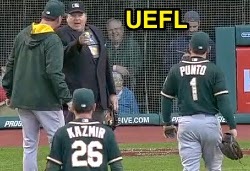 This is the A's' 1st ejection of 2014, 4th in the AL West (SEA 4; TEX 3; HOU 2; OAK 1; LAA 0). This is Athletics Manager Bob Melvin's 18th Replay Review of 2014. This is Scott Kazmir's first ejection since Sept 27, 2004 (Bruce Dreckman; QOC = U [Throwing At]). This is Jerry Layne's first ejection since May 13, 2014 (Joe Girardi; QOC = N [Balls/Strikes]).